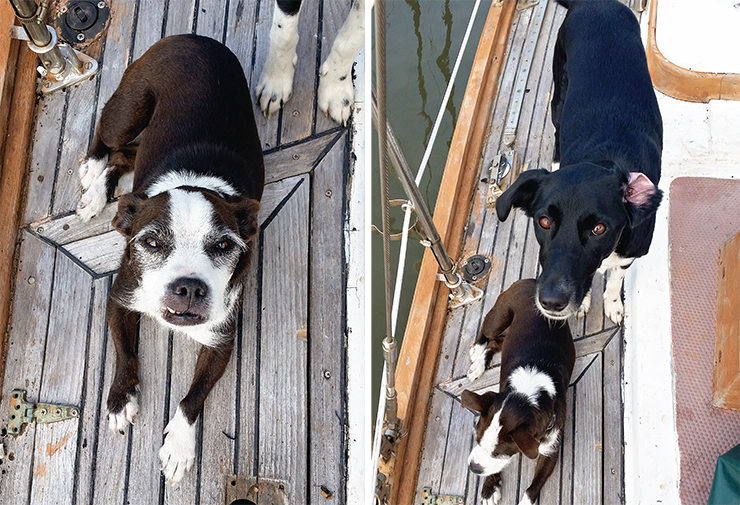 Living on a boat that has a very long “to-do” list of projects while you are working full time is really hard. We just can’t seem to get anything done! Hell, it took me 2 weeks to switch out our tv mount. Squeezing in a project that should only take a few minutes can be so daunting when you have to cook dinner, walk the dogs and answer work emails. Wah, first world problems, AMIRIGHT? 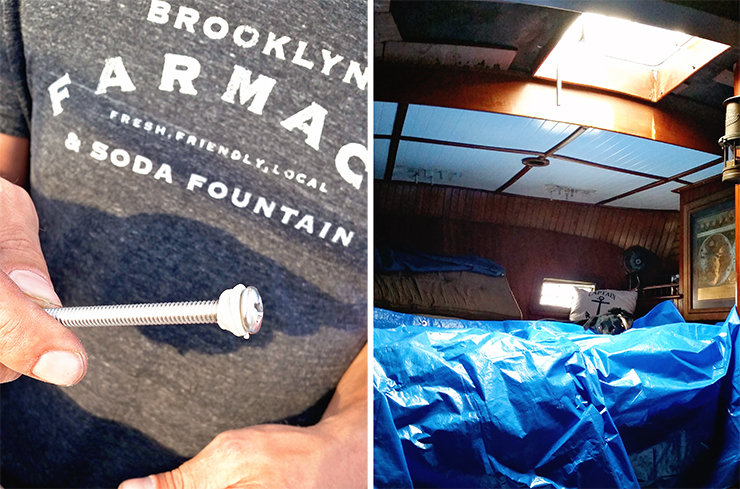 What we have been able to do in the nearly 6 weeks our boat has been in NYC is to start tackling some of the leaks on the boat. And let me tell you, there are A LOT of them. Prepping for rebedding our hatch, but you can see the dowels coming through the headliner that we shoved through the previous davit holes. The first thing we did when the boat arrived was to remove the ugly davits, stuff the holes with dowels covered in 5200 and hope for the best until we properly addressed the worn teak deck. Turns out approximately zero sealant was originally used when these bad boys were installed so you can use your imagination on the amount of water that POURED in the aft bunk each and every time it rained. We tackled this about an hour after the boat arrived because we knew we couldn’t even think about sleeping on the boat until that problem was fixed. The second leak we successfully removed was one of the water deck fills. We removed the deck fill and sealed it in with a crap ton (official measurement) of 5200. We usually don’t like to use 5200, but we were desperate to stop the water, we had a tube of it lying around, and the forecast called for a lot of rain the next day. We generally prefer butyl tape or 4000 depending on the application. Typically, if it involves screws we go for the 4000 while if it uses through bolts we opt for the butyl tape. The screwing in motion can actually pull the butyl tape out of position effectively creating gaps in the seal. Last weekend we started the painful task of rebedding our hatches. 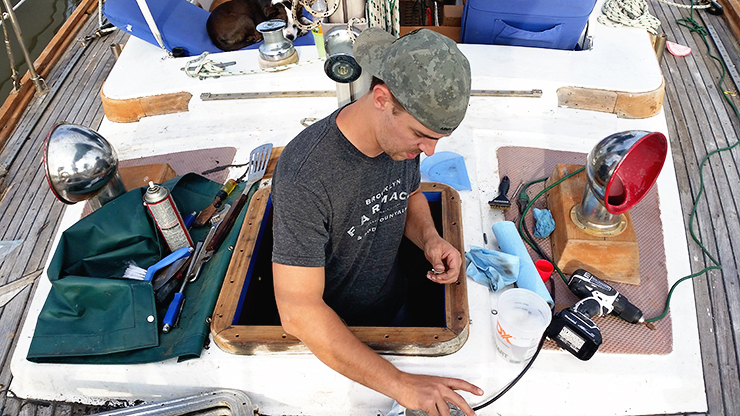 We started with the hatch over the aft cabin so we could officially turn that part of the boat into a “leak free zone.” (A girl can dream, right?) When we set out to start the project, we thought this may be an easy project given the sealant looked original and would likely be easy to break free. We were partially correct. Dewey and Riley watching us as we work. The sealant was in fact easy to break. But, what we thought were screws holding the hatches in place were actually through-bolts. In order to gain access to the nuts, we had to remove no less than 19 trim and ceiling panels. This included removing the nails holding the panels in place. PSA – NAILS SHOULD NEVER EVER EVER BE USED ON A BOAT. They are impossible to remove without damaging the wood around them. Once we got all the bolts removed, we got rid of all the left over sealant. Armed with our butyl tape, we started the process of resealing the hatch. Turns out 3 of the 18 bolts used were 3.5” while the rest were 4”. Of course we didn’t notice this until we started reinstalling everything so we had no idea which holes needed the shorter bolts. That was a fun game to play. So after a full day of work the hatch was rebed and in the end we’re pretty sure we didn’t even need to rebed it in the first place. We think the water leaking in was coming from the seams where the teak comes together to form the combing or where the combing meets the deck. We’ll be filling those this weekend with epoxy/sealant. For the remaining 3 hatches, we’ll try that first before we rip everything up. Ugh, boat work. We did get to celebrate finishing this task we probably never even needed to do with our new dock neighbors over some yummy homemade empanadas! You win some, you lose some.